Issue 6.4 is now online! The April issue of Methods, which includes our latest Special Feature: “Opportunities at the Interface Between Ecology and Statistics” is now online! Opportunities ar the Interface Between Ecology and Statistics is a collection of eight articles which arose from the Eco-Stats Symposium at the University of New South Wales (Australia) in July 2013.This Symposium was designed to be a collaborative forum for researchers with interests in ecology and statistics. It brought together internationally recognised leaders in these two fields (such as Jane Elith, Trevor Hastie, Anne Chao and Shirley Pledger) – many of whom have contributed articles to this Special Feature. In his Editorial for the Special Feature, Guest Editor David Warton suggests that one of the reasons for the success of Methods in Ecology and Evolution may be that it provides a forum for statisticians and ecologists to interact. The articles in this issue, and the conference that gave rise to them, show that these interactions can provide significant benefits for both groups. There will be another Eco-Stats Symposium at the University of New South Wales in December of this year (8-10 December, 2015). For more details on this, please click here. This month we have a two Open Access articles. The first is included in the Special Feature. In ‘A climate of uncertainty: accounting for error in climate variables for species distribution models‘ Jakub Stoklosa and his co-authors show how information on uncertainty associated with spatial climate variables can be obtained from climate data models. They propose a framework that allows for many possible extensions and improvements to species distribution models. The second Open Access article in the April issue, ‘Towards the identification of the loci of adaptive evolution‘, is a Review by Carolina Pardo-Diaz et al. The authors review the experimental tools that have been applied to document the molecular basis underlying evolution in several natural systems to highlight their benefits, limitations and suitability. 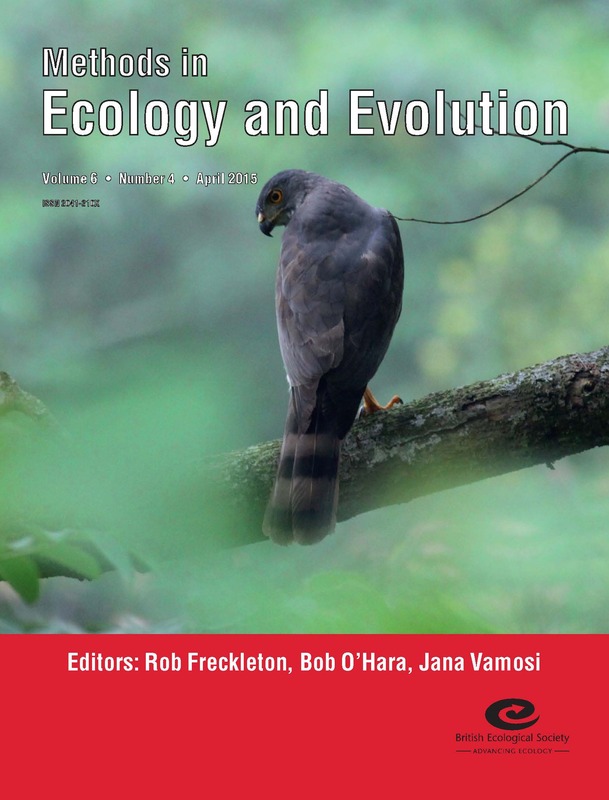 This month’s cover image shows a crested goshawk (Accipiter trivirgatus formosae), an endemic Taiwanese subspecies and one of over 600 bird species recorded in Taiwan. The diversity and beauty of these fascinating and spectacular birds and their natural environment inspired Anne Chao et al. to tackle some of the mathematical and statistical problems arising in ecology and evolution. These include (i) how to quantify the three major dimensions of biodiversity (ii) how to construct a seamless rarefaction and extrapolation sampling curve to standardize sample completeness, and (iii) how to infer the undetected biodiversity from incomplete samples and assess the sampling uncertainty of estimators. In their paper, ‘Rarefaction and extrapolation of phylogenetic diversity‘, the authors theoretically derive an estimator of the undetected phylogenetic diversity in samples for the first time. This entry was posted in Journal updates, Methods papers and tagged Bioclimatic Variables, Climate Maps, Eco-Stats Symposium, ecology, evolution, Functional Diversity, Maximum Entropy, methods, Multivariate Data, open access, Phylogenetic Diversity, Point Pattern Analysis, Presence-only Analysis, Special Feature, statistics, Visualising Data by Chris Grieves. Bookmark the permalink.